The planning process focused on creating a single integrated vision for the area surrounding 30th Street Station continues this Wednesday with an open house. The 30th Street Station District Plan project team will present refined design ideas for the area. The open house will be held from 4 – 7 p.m. at the station, behind the Amtrak ticket office. • “Central Business District 2,” a new central business district. 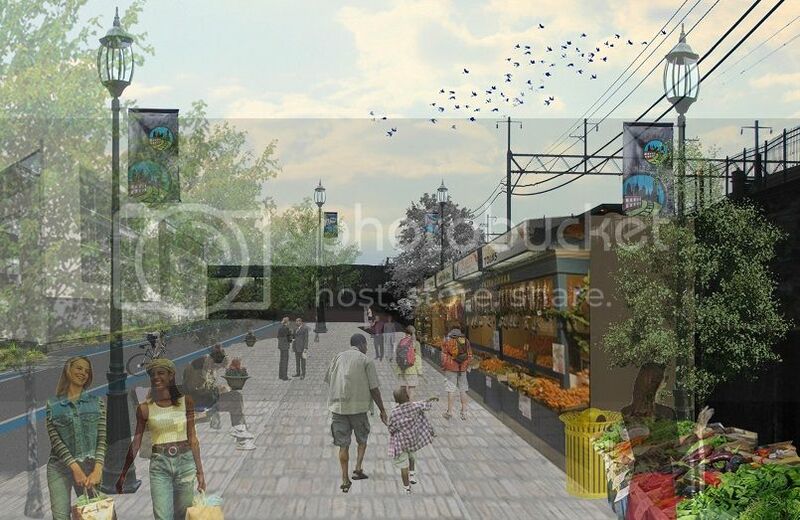 • “Schuylkill Crossing,” a new urban neighborhood. • “Innovation City,” which hooks in with nearby universities, mainly Drexel. Nearly 1,400 comments were received at the June open house and from an online survey that was posted on the District Plan website. The summary report is available here. The 30th Street Station District Plan is a joint planning effort led by Amtrak, Brandywine Realty Trust, Drexel University, PennDOT and SEPTA with support from a wide range of public and private agencies, area stakeholders and other interested parties. For more information, visit: http://www.phillydistrict30.com/. 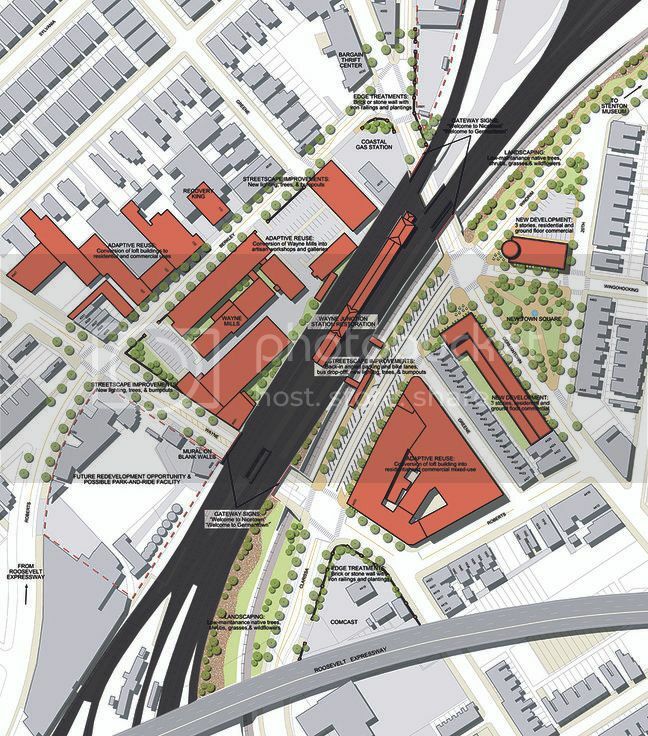 The most recent draft of the 30th Street Station District Plan calls for a partially capped rail yard that will feature a mixed-use neighborhood, pedestrian bridges over the Schuylkill River, and an expansion of the station itself. 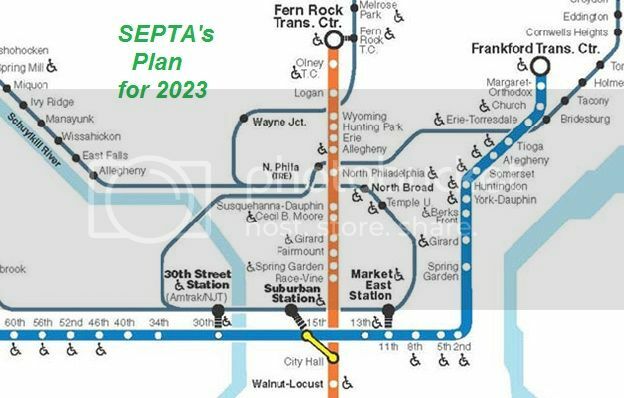 The plans were unveiled Wednesday night at an open house held at 30th St. Station and are part of a $5.25 million study that includes 175 acres of land surrounding the station—88 of which include the rail yards owned by SEPTA and Amtrak. Prior to the open house the Philadelphia Inquirer reported that although public comment this summer favored capping most of the rail yard, the most recent draft shows that only 70 acres can be covered due to "engineering challenges." Take the last Trolley to Clarkville? and guzzling craft beer and wine seven days a week from 11am-1am. Join us, won't you? One of the first things you notice as you walk in Jinxed, the new shop on the 4500 block of Baltimore Avenue, is a pair of nicely preserved small alligator (or crocodile or caiman) heads near the door. They kind of set the mood for the place. It’s one of those places that you want to come back to once in a while to see what they have found. Jinxed started in the 1990s as a t-shirt company and has since opened five retail locations in the city that sell all kinds of vintage and interesting stuff, everything from furniture and antiques to clothing and vintage lighters. SPRUCE ST., West Philly - How nice is it? How Safe? / Zoning changes coming? How big is Spruce Hill ? 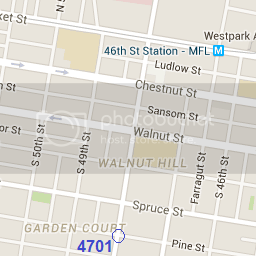 Spruce Hill: "... is between 40th and 46th streets, and it stretches from Market Street south to Woodland Avenue. It has a population of over 16,000. It was built as a streetcar suburb for Center City between 1850 and 1910. 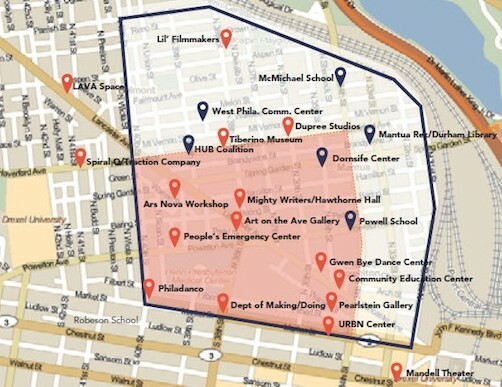 It is a racially and ethnically diverse part of the city, where much historic architecture is preserved...The University of Pennsylvania campus extends into Spruce Hill and the University of the Sciences campus is also in the neighborhood. " "A diverse mix of housing types, including the 116-unit Garden Court Condominiums. It is a racially mixed neighborhood. 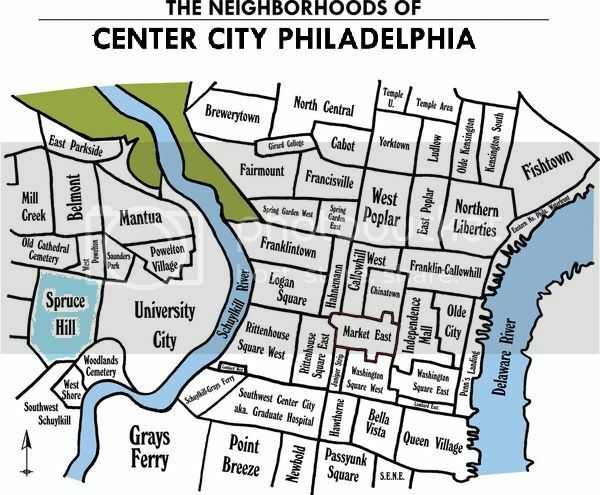 Income and property values are greater than those of West Philadelphia as a whole." "In the heyday of the 1920s, the Garden Court District was regarded as 'the most exclusive location in West Philadelphia', providing a rare combination of "modern apartments of magnitude, comfort and luxury, surrounded by beautiful homes" (Philadelphia Inquirer, 27 October, 1927, p.6W). To modern urban historians, the integration of imposing apartment houses into a hierarchically developed suburban setting makes Garden Court an original contribution to community planning, one that suggests an American awareness of Ebeneezer Howard's Garden City plan of high density development surrounded by low density development, and perhaps of Le Corbusier's Radiant City as well. Garden Court's comprehensive accommodation of the transportation system of this century, the automobile, is also suggestive of an awareness of Garden City theory, with remarkable similarities to Raymond Unwin's separation of people and vehicle patterns in Letchworth, England. " (47.47% African American, 42.26% White, 3.36% Hispanic, 4.82% Asian, 0.34% American Indian or Alaskan Native, 3.66% "some other race", and 1.45% are two or more races). It is diverse, ethnically: 14.65% of people living in our community are foreign-born. There are a mix of ages, from children to seniors. The community is home to people and families making a range of incomes: median household incomes for our community range from $24,464 to $63,452. Q: I am considering a move to Philadelphia, and West Philly seems to be the best fit for me. As you travel west, the rents obviously become cheaper, but I just wanted to know how far west the safer areas extend. I've heard not to pass 45th, 50th, or 56th street by various people. What is the consensus on this? A1: The lower the street the better off you are. 45th is better than 50th. 40th is better than 45th etc etc. The closer you move towards the hood (say 50Th St.) the better chance you have of becoming a victim of crime. A2: It's not a straight east-west thing. 49th and Baltimore is a safer neighborhood than 42nd and Market. The line of sketchiness runs northeast-to-southwest across West Philly. Baltimore Ave is a good street for further out than Market, Chestnut, and Walnut, which get sketchy fast. A3; I am a mailman in West Philly, so I see a few of neighborhoods on a daily basis. West Philly is actually getting better between Penn and Drexel outwards up to about 50th St as someone else posted. 2009: I live in West Philadelphia and I really like it. The cutoff point in West Philly is around 52nd street. Though I have visited a friend a night around there and felt fine. The cutoff point to the north depends where are you at. 42nd and Market can get sketchy. 45th or 46th and Chestnut. 49 and Walnut. 2011: Then there are somewhat more fringy areas, where hipster-types and other adherent of alternative subcultures makes up the majority, with the occasional black/South Asian/ Middle Eastern family and not-yet-wealthy professional as well. These are areas such as Ludlow to Locust, 42nd to 47th, to the north, then to the west from Spruce to Baltimore, 47th to 51st, and then finally to the southwest, everything south of Baltimore, east of 51st, and north of the train tracks. I've seen white newcomers to the city raise very happy families here, too, but most of it is not part of the Penn Alexander catchment, making schooling more iffy. Garden Court Community Association (GCCA) is holding a zoning meeting this Thursday (Jan. 16) about a new building proposed for 5027 Spruce Street. Community members are invited to attend the meeting to learn more about the project and to provide their input. The proposed building is a multi-family, four story apartment building, which will be nearly identical to the four story building at 5038 Spruce (see images below). The public forum to discuss the proposed construction will take place at 6 p.m. in the Vineyard Community Church (corner of 51st and Sansom Streets). Those who would like to attend the meeting but can’t make it are invited to contact GCCA’s Zoning Chair, Mariya Khandros, via email (mariya.khandros@gmail.com) with any questions or concerns. A multi-family four story apartment building is being proposed at 5027 Spruce Street. Four story building at 5038 Spruce Street (Source: Google). Proposed zoning changes fall within the area pictured above. Proposed zoning changes for the area stretching from 45th to 50th streets and between Chestnut and Spruce streets will be the subject of a public meeting tonight at the Lea School Auditorium (47th and Locust). Councilwoman Jannie Blackwell introduced the proposed changes on May 8th and the City Council’s Rules Committee hearing (the last opportunity for public input) is scheduled for Tuesday, June 3, according to Garden Court Community Association’s Zoning Chair Mariya Khandros. The Garden Court, Walnut Hill and Spruce Hill neighborhoods are included in the area, so residents in these neighborhoods are encouraged to attend today’s meeting to provide their input (yes, we know it’s Friday night but the zoning changes affect almost every block in that area, so the organizers want to make sure that as many residents as possible give their input). The changes include switching some parcels from multi-family to single-family zoning, or changing a commercially zoned location to residential. The parcel that includes the old West Philadelphia High School would also reportedly be zoned for commercial use, presumedly to clear the way for development of the high school building. Former Transition To Independent Living Center building at 4534-36 Spruce St (archived photo). The new owners of the former Transition To Independent Living Center building at the corner of 46th and Spruce streets will be at the Spruce Hill Community Association’s zoning meeting on Thursday, Aug. 6, to hear what neighborhood residents want to see developed at the site. The building went up for sale again in June after its owner, Mission First, didn’t receive enough funding for the development of an affordable housing project at the site. The new owners have not been identified yet. The meeting will take place at SHCA’s office at 257 S. 45th St., beginning at 6:30 p.m., and the 4534-36 site will be discussed first (for approximately 30 minutes). The Phila-2035 plan (approved 2013) for Univ/SW does not yet go further west than 46th St.
30th Street, 40th Street, and 46th Street to enable higher density, mixed-use development." "Key issues in West Philadelphia are vacant homes, vacant lots and a lack of quality commercial options. The high vacancy rate contributes to crime problems, disinvestment and a lack of home equity. Commercial corridors are generally under-performing in comparison with the rest of the City. This means that residents have to travel further to get what they need, or settle for lower quality products and services." The 46th Street MFL Station Area provides the greatest opportunity for large-scale redevelopment. 46th Street TOD: Higher buildings? CMX-3 (mixed use, up to 8 stories) would be appropriate in terms of density but also for its ability to activate a floor area bonus for mixed-income housing provision, something that is becoming increasingly crucial as property values increase and large universities and hospitals seek to recruit and retain work-forces. CMX-2 (2-story zoned) parcels in this area along Chestnut and Walnut could be up-zoned to 2.5 or 3.
possibility of redeveloping the area as a TRID (Transit Reinvestment District) has been explored and should be re-visited. Establish appropriate mechanisms to capture the real estate taxation and other values added by joint development activities for reinvestment in the transit system and local communities. ... Eligible TRID locations are defined by distance from a transit stop or station (at least 1/8 mile, but no more than ½ mile), and may include vacant, underutilized or potentially redevelopable land. Specific boundaries can be tailored to local circumstances based on property boundaries or other factors, when authorized by the jurisdiction and the transit agency, and supported by a TRID study. Transit agencies may purchase and improve property within a TRID, consistent with existing authority and limitations on transit agencies to condemn and acquire land for public transportation purposes. A transit agency may not be the primary real estate developer, but it can purchase property, make improvements, and work with the local jurisdiction(s) to offer it for sale TRID Opportunities and Challenges for Implementation for uses consistent with the plan. Alternatively, they can advertise the presence of development opportunities within the plan area. No zoning or other squabbles ever took place because the four adjacent buildings belonged to one person—Mary M. Parke, a widow and heir to the Parke Bank fortune who lived in a 6,000-square-foot mansion on 63rd Street in Overbrook. But it did run into other issues. By 1912, the building was only seven stories high, with the eighth floor not even constructed yet, and its interior unfinished, too. The whole eighth floor of this residential tower with street-level commercial space was supposed to be a deluxe apartment in the sky high above the street, spatially lit by a skylight, which was beyond modern for its time. he view north on 52nd today, with the Parke Building on the right. Student poverty may not e genuine poverty; but there is real poverty in some parts of the district. in the district, and not the typical signs of distress or disinvestment, usually associated with these kinds of indicators. 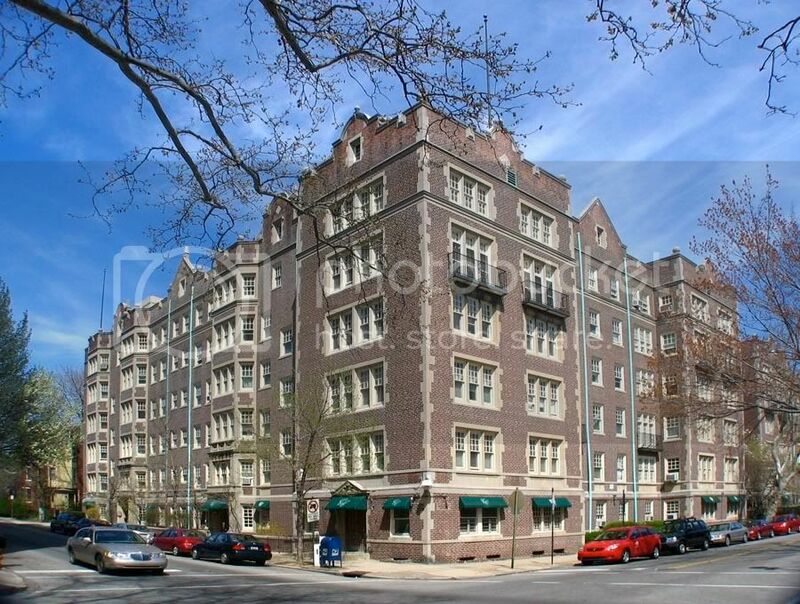 While the student population in the district has expanded outside of the traditional bound aries of the University area, the majority of students live in dormitories and rental units in the University City, Powelton Village and Walnut Hill neighborhoods. Many students living in these areas are unemployed or under employed and despite having lower incomes and being technically classified as living in poverty by the Census, actually receive funding from other non-documented sources. Declining homeownership rates may be attributable to: attrition of older homeowners; homes being converted to rentals to accommodate students; and increased property values making home purchases cost prohibitive for the large number of young people that live in the district. The population losses in the district are clearly a result of long-term declines in Black and White population. However, over the past decade, Whites have reversed this trend by increasing population for the first time in twenty years. While Blacks make up the majority of district’s total population, they only comprise a majority population in four of the district’s ten neighborhoods (Bartam, Kingsessing, Sauders Park and West Powelton). In fact, 62% (or 26,245 people) of the district’s total Black population (42,673 people) live in the Kingsessing neighborhood. The remaining Black population is dispersed throughout the district. As of 2010, 62% of the total Black population (or 26,245 people) in the University/Southwest District live in the Kingsessing neighborhood. 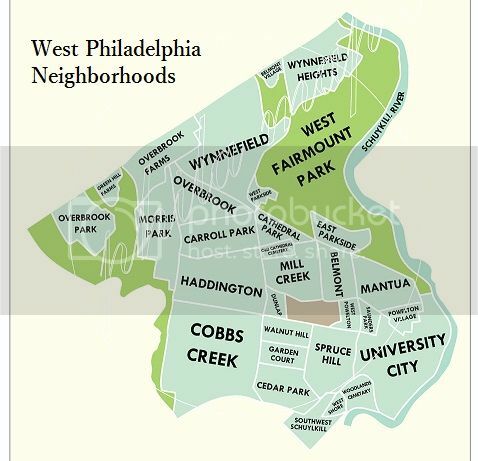 As of 2010, Whites make up the majority of the population in: Powelton Village, Cedar Park, Garden Court, Spruce Hill, University City and Walnut Hill. With the exception of Garden Court, all of these neighborhoods have had majority White population for the past thirty years. (see Table 2A). As of 2010, the largest number of White people lives in Walnut Hill (10,180). Over the past thirty years, the number of homeowners in the University/Southwest District have steadily declined , as the number of renters has steadily increased. Looking at historical data from 1980 , 1990 and 2000, it appears that the loss of homeowners units is directly related to the loss of Black population. Those neighborhoods with higher percentages of Black population, tended to have higher owner occupancy rates. This is particularly true in Kingsessing, where Black homeowners comprised 65% or more of all the owner occupied housing units. As of 2010 ,the owner occupancy rate in the University/Southwest District was 32.42%, with a renter occupancy rate of 67.58%. The Citywide owner occupancy rate was 54.1 %, and the Citywide renter occupancy rate of 45.9%... Between 2000 and 2010, owner occupancy rates declined in every neighborhood in the University Southwest District, except for Garden Court. Post Brothers paid "part of a" $250 million budget, a hefty and impossible $1.73 million per apartment for Garden Court Plaza, as neighborhood residents "are bracing for big changes". - so they must have more big buys in mind. A founder of Post Brothers told the Philadelphia Business Journal that there is a shortage of housing geared toward “young professionals” in the area, which he compared to Cambridge, Mass., and that the firm’s strategy is to “upgrade and reposition” properties. Post Brothers will do substantial renovations to Garden Court Plaza’s interior and exterior and add upscale amenities, according to a press release. Some current residents who have contacted West Philly Local and asked not be named say they are bracing for big changes, including a substantial rent increase. They said that the new management company has begun asking for tax and pet vaccination information from residents. Matt Pestronk did something at last night’s annual Spruce Hill Community Association (SHCA) member meeting that property developers rarely do anymore in the neighborhood. He voluntarily showed up and answered questions from residents about the reasons his company, Post Brothers, plans to spend some $250 million on apartment buildings, including the newly purchased Garden Court Plaza building at 47th and Pine. Pestronk, who owns the company with his brother Michael, took questions ranging from whether they would allow pets in their buildings (an emphatic “yes” on that one) to whether Post Brothers would convert any rental units into condos and put them up for sale (probably not). The company has acquired several buildings in recent years including: 4311 Spruce Street; The Netherlands at 4300 Chestnut; Chester Plaza at Farragut and Chester; Chester Hall at 4205 Chester; Hamiltion Court at 3800 Chestnut; and Garden Court Plaza. Altogether, they have accrued about 550 units. Pestronk said he is interested in what residents want in retail. While this is great news for many, some existing businesses may not fit in. At Garden Court Plaza, for example, Pestronk said that the Take the Lead dance studio occupies the most valuable retail spot (on the northwest corner of 47th and Pine) but may not be the best business for that spot. Post Brothers will be renovating several of the buildings in coming years, but Pestronk added that they will not necessarily target young students. The historic Garden Court Plaza apartment building will get a full-gut rehab, as the developer plans to invest $250 million in UCity.. .
"Post Brothers will recreate the building’s “green roof” atop its 260-car parking garage, effectively creating a private park complete with dog runs and lounge areas," says the press release. 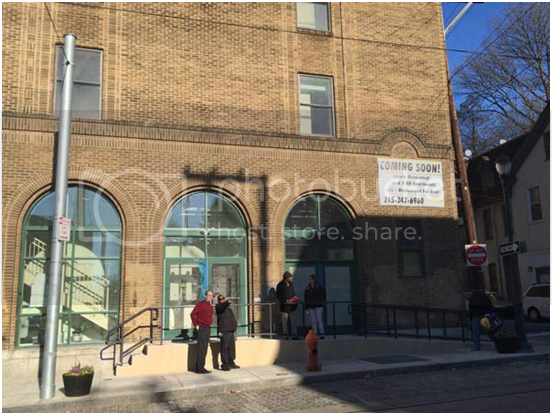 Post will restore other historic features of the building, including the dual-panel front door system previously used as pick-up/drop-off points for dry cleaning. The terms of the deal were not disclosed. New Houses in West Philly, to fill in "missing teeth" ? A zoning meeting for a potentially highly-valuable piece of property on the 5000 block of Hazel Avenue is scheduled for Thursday, Dec. 17. Residents are invited to hear the proposal to build a three-story single-family home on a vacant lot at 5023 Hazel Avenue, between two other three-story homes. The meeting is organized by Garden Court Community Association’s Zoning Committee and will be held at Ahimsa House, 5007 Cedar Ave., starting at 7:30 p.m. Everyone who has questions or concerns about this proposal is welcome to attend the meeting. The 2,200 square foot lot was purchased for $60,000 in July 2015 by Elkins Park based company HSSK LLC, which is planning to build a semi-detached structure with a roof deck and a pilot house for access to the roof deck, according to the information posted on the City’s Office of Licences and Inspections website. The cleaning of the lot ahead of the construction has already begun (pictured). Garden Court, is only the first buy in a larger budget. Post Brothers has “earmarked” $250 million to invest in projects that look to keep recent grads and a growing workforce in and around University City (47th and Pine is really Walnut Hill). “Our principal goal is to harness the energy of this exciting neighborhood to create re-imagined, high-quality apartments that are reflective of the neighborhood’s vibrant, upwardly-mobile population,” said Post’s CEO Michael Pestronk. 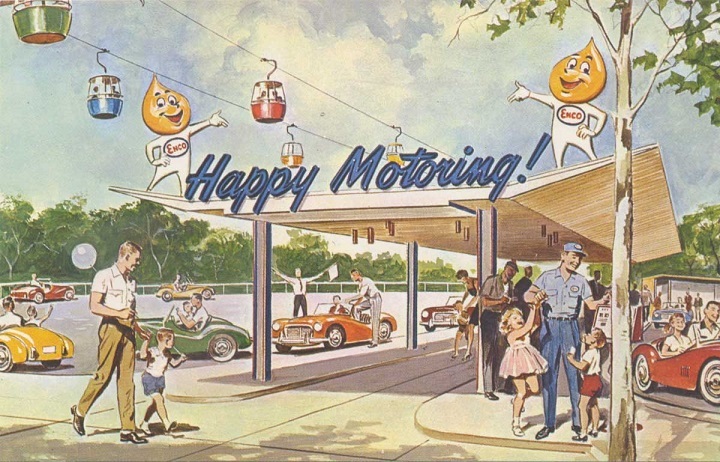 The End of Happy motoring? Too expensive, Too wasteful? Happy Motorists (enjoying hidden subsidies) were driving the US into bankruptcy - There's a better and more efficient way. Rebuilt the rail infrastructure where it already exists, and add density around the stations. Economically, these makes great sense. But crime needs to be reduced and schools improved to attract people back. This is happening around the core of the Central City. And gentrification is spreading out from there, and along some rail links. Rachel Quednau interviews Randy Simes all the way from Seoul, South Korea, to talk about the Ohio Department of Transportation’s expected announcement of a major shift toward “fix it first” policy, and away from new road projects. Randy is the founder and managing editor of UrbanCincy, news sources for Cincinnati’s urban core, as well as an urban planner who has worked around the world. > Read Randy's article on UrbanCincy. Chuck and Rachel discuss this week's #NoNewRoads campaign. They touch on the new federal transportation funding bill, issues in Texas, Minnesota and Washington state, as well as a fascinating new tool you can use to look at transportation funding priorities in your own state. MFL / Market Frankfort Line runs through West Philly ... pd. 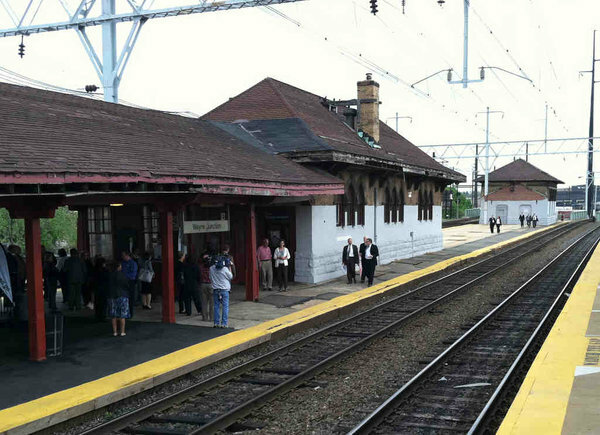 The reconstruction and modernization of Wayne Junction Station is SEPTA’s most ambitious and complicated station renovation to date. ...a total project cost of over $20 million. The Wayne Junction project is not only about making improvements to a train station, it is part of a much larger and coordinated project: a Transit-Oriented Development or TOD. 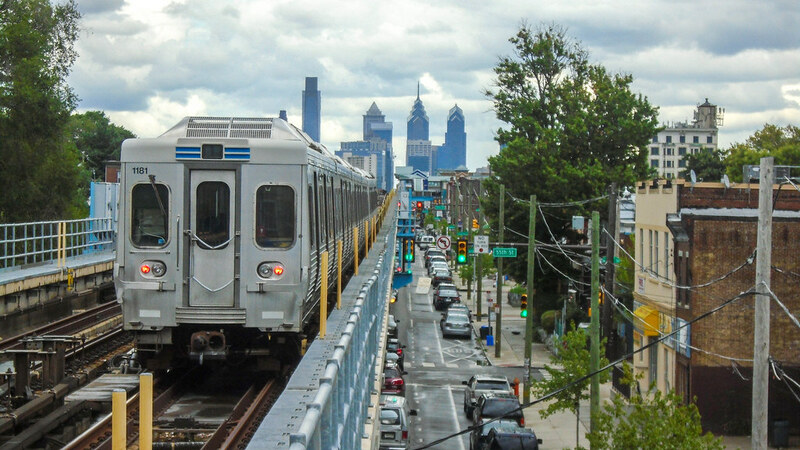 In addition to SEPTA, various other public, non-profit, and private entities are undertaking efforts that leverage Wayne Junction’s high-frequency, quality, multi-modal public transportation for neighborhood revitalization and economic development. More information about these coordinated efforts are on the reverse of this page... SEPTA has committed to investing in one TOD project every year. So what is TOD and how does it make neighborhoods livable and sustainable? TOD is more than just construction or renovation of houses or shops close to a transit station, rather it is development that creates “location efficiency”. Location efficiency allows people to be automobile independent by providing convenient access to jobs, housing, shops, and community assets such as schools and cultural institutions by clustering them near transit. Transit is the catalyst for community growth and revitialization in a TOD. TOD is sustainable because encourages a healthy lifestyle by promoting walking and biking for daily commutes and errands; frees up money used for personal vehicles to be spent on other needs; and creates a sense of community and place by clustering activities and destinations. Location: Gateway to the Nicetown and Germantown neighbrohoods, 4494 Germantown Avenue, Philadelphia, PA 19144. History--: The architects were Wilson Brothers & Company. Constructed: 1901, for the Reading Railroad and is on the National Register of Historic Places. Route 75 Trackless Trolley; Bus Routes 23 & 53. Ridership: Over 190,000 riders annually, across all rail, bus, and trackless trolley lines. Weekday ridership at the train station averages over 600 passengers. Project Cost: Over $20 Million. / Project Completion Date: Spring 2015. In a neighborhood short on new developments and long on challenges, just about any project is welcomed. In Philadelphia's Nicetown, a transit-oriented development (TOD) project known as Nicetown Court II is being viewed as a key piece in the neighborhood's comeback puzzle as it would bring low-income housing and retail to the community around the Wayne Junction train station. Nicetown Court II is designed with 50 low-income rental units and ground-floor retail, according to Richard Redding, the director of the Community Planning Division of the City Planning Commission. The complex would be at the intersection of Wayne and Windrim Aves, across the street from Wayne Junction. The apartments would be mostly two- and three-bedroom, with a few four-bedroom units. In addition, Redding adds there would be around 5,000 sq. ft. of retail, which could be frequented by Court residents, other Nicetown residents, or train commuters. There will be a stop for SEPTA’s Route 23 bus right outside the Court that can take residents to Northwest, North, and South Philadelphia, and Center City. The complex is also a pebble’s flick away from Wayne Junction. “This is a train station that is being re-constructed,” says Redding, who adds that this development is in line with his agency’s TOD plans for both Nicetown and Germantown. The Wayne Junction SEPTA Station renovation has been underway for a little over a year and already developers and community groups are buying up nearby property, anticipating increased demand for living and working close to one of Philly's busiest transit hubs. 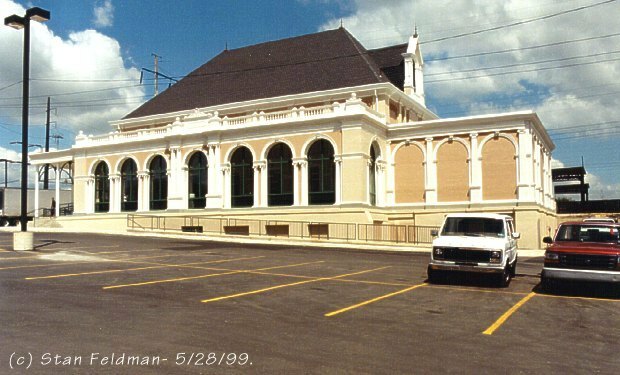 The Frank Furness-designed station was rebuilt in 1900. 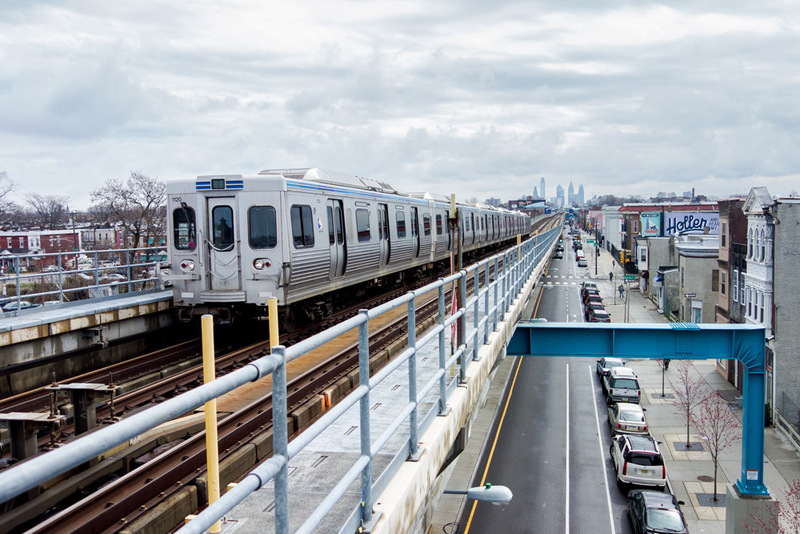 It sits at the nexus of Germantown and Nicetown, and serves five different regional rail lines, making it one of the most heavily trafficked train stations in the city. Now, a $25 million renovation will bring the neighborhood anchor into the future, and hopefully spark the area's transformation. Though progress has been slow, private investment has begun to pick up on the Germantown side of the station, notably in the Wayne Junction Industrial Historic District. Lower Germantown has tremendous potential -- it is rife with beautiful, historic, underutilized buildings. Last year, developer Ken Weinstein of Philly Office Retail bought the former Max Levy Autograph Co. building on Roberts Avenue. "I was really encouraged by SEPTA's investment in upgrading Wayne Junction," says Weinstein, "otherwise I wouldn't have bought the building." This past summer, Weinstein and company got to work removing asbestos and clearing the vacant structure of hazardous materials. Weinstein hopes the building can eventually be utilized as offices, lofts and artist studios. 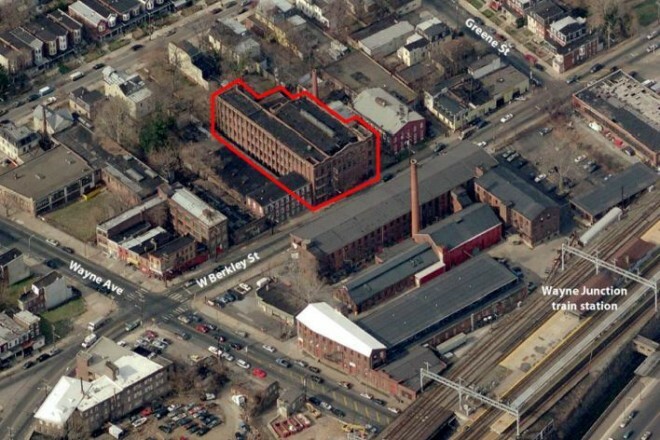 Weinstein has also bought other buildings close to Wayne Junction, including the former Germantown Settlement Charter School (that project was detailed in a recent issue of Flying Kite). Transit proximity was a key factor for the school's new tenants, GreatnessIsInYou!, a community performance space, and the non-profit New Directions for Women. Real Estate Strategies, Inc. was part of a consultant team that prepared a plan for the Germantown and Nicetown neighborhoods of Philadelphia. 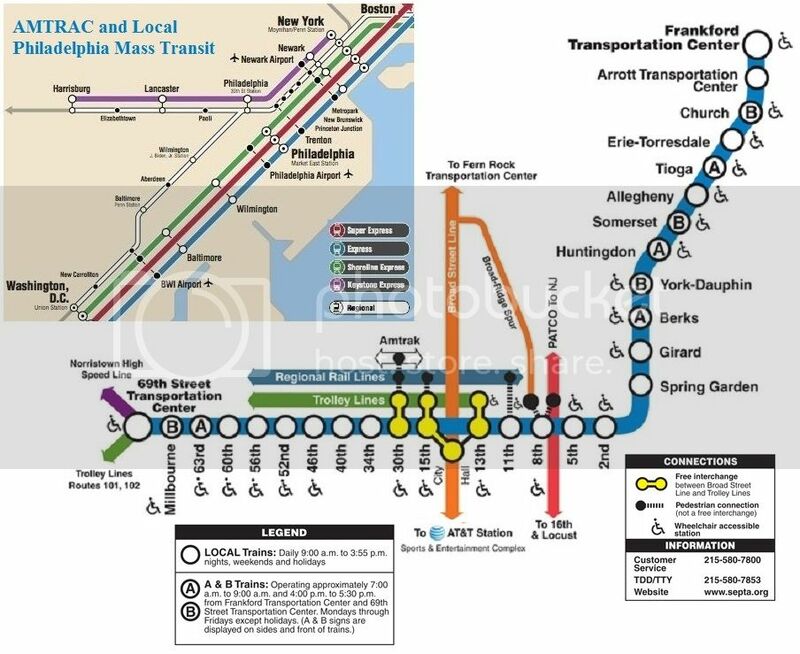 The neighborhoods have five SEPTA regional rail stations including the Wayne Junction station that is a major transfer point, as well as numerous bus routes. The goal of the study was to explore residential and business district revitalization strategies that take advantage of the neighborhood’s rich transit resources. RES served as market analyst for the team, preparing economic and demographic profiles of three sub-sections of the study area and advising on market issues influencing development plans. In particular, the profiles have identified specific real estate market opportunities within each of the areas, particularly as they relate to redevelopment around the train stations. RES also participated in stakeholder outreach and a community visioning session and assisted with the development of the plan’s implementation strategy. Less costly, more frequent service could become possible as soon as next year. 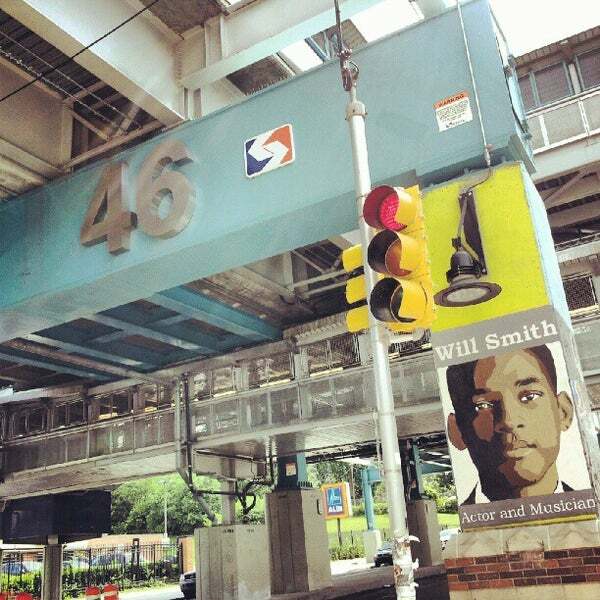 Will SEPTA seize the day? Philadelphia's Regional Rail network used to have many more — and more closely spaced — stations than it does now, and it used to extend further into the city's hinterlands and operate on more corridors. Those corridors were served by diesel rail cars operating out of the Reading Terminal. 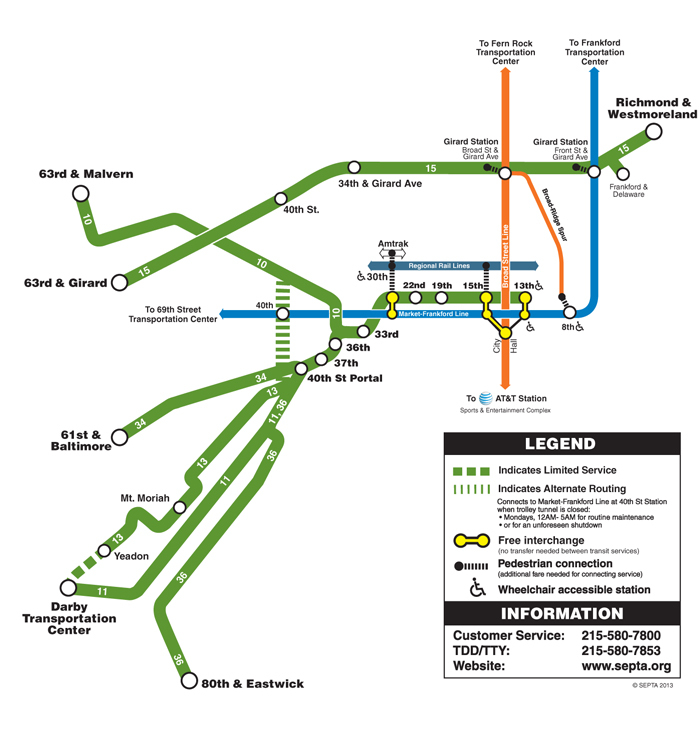 When the Commuter Tunnel and its Market East Station replaced the terminal in 1984, SEPTA eliminated all non-electrified service because diesel-powered trains could not run in the tunnel. That's still true today. But with recent improvements to facilities just outside the tunnel, it is possible to run diesel trains to stations equipped to handle transfers well. On the Reading side, the rebuilt Wayne Junction makes an ideal transfer point. On the Pennsylvania side, 30th Street Station's suburban platforms could be re-extended to handle the extra trains. Service of this type could be operated more frequently as well, and it could be done with smaller crews than are required for the mainline railroad trains. 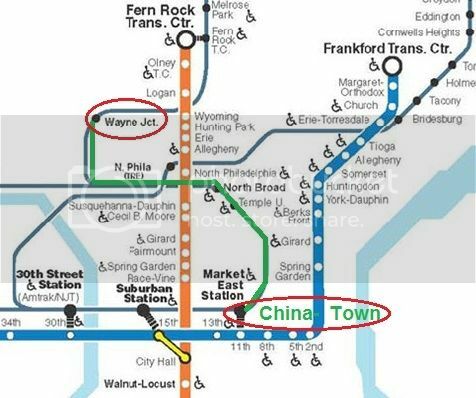 More frequent off-peak Regional Rail service would not only be good for Center City, it would unlock the potential for transit-oriented development and redevelopment of our region's suburban town centers as well. 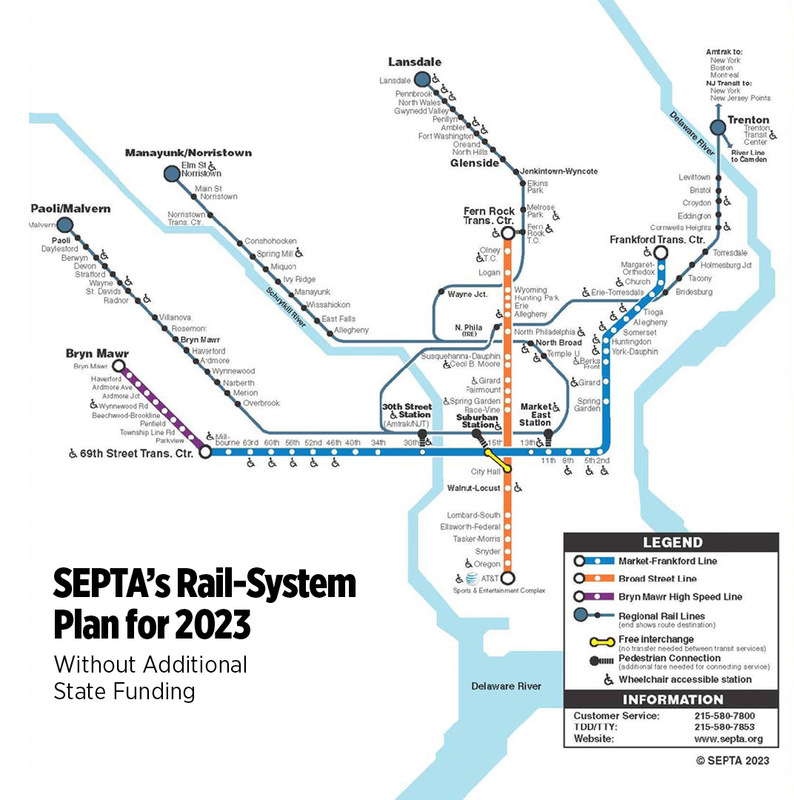 Given all the upside potential, SEPTA would be wise to give this idea a good hard look. The Transit Revitalization Investment District Act of 2004 (TRID) is Pennsylvania legislation that promotes transit-oriented development. TRID designation accesses planning monies, prioritizes state funding, and allows value capture areas that function like tax-increment financing districts for funding transit improvements. Expand the intermodal transit center at 30th Street Station to connect bus, regional rail, high speed rail, and pedestrian and bicycle networks. Rehabilitate City Hall and 15th Street Subway Stations. Expand the intermodal transit center at Market East to connect intra- and inter-city systems and consolidate inter-city buses. Utilize existing regional rail infrastructure to create “City Rail”, an enhanced regional transit network with frequent service and extended hours. Philadelphia is ideally positioned in the center of the Northeast Megaregion and would greatly benefit from high-speed rail service (HSR). The Northeast Corridor route has a culture of rail ridership, population growth, and a demand for inter-city travel that cannot be met by current transportation modes. The Amtrak Northeast Corridor route has historically been the most popular route in the national passenger operation system. Recent national momentum is building towards true high-speed rail, which could reach speeds of up to 220 mi/hour and travel the entire distance of Boston to Washington, D.C., in less than 3.5 hours. In 2010, Amtrak created a high-speed rail department in Philadelphia and, in early 2011, requested proposals for financing a new high-speed corridor from Boston to Washington, D.C. 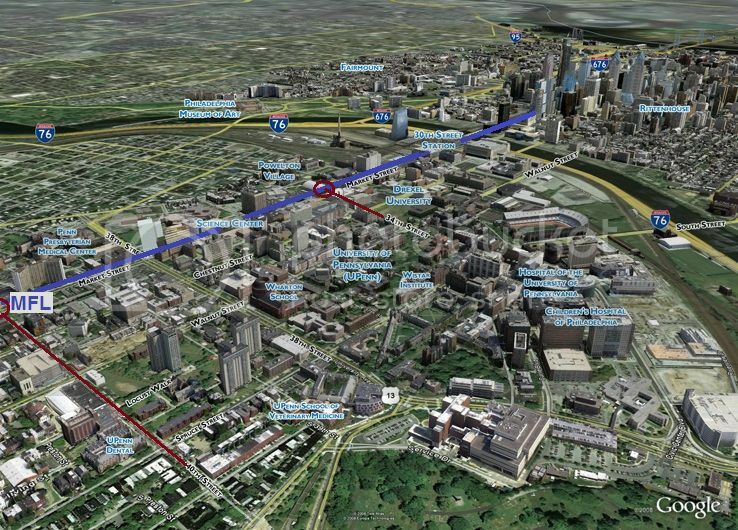 Projects in Philadelphia as a result of a high-speed rail system could include a seven-mile tunnel beneath the city connecting the International Airport and Market East Station and new tracks and station infrastructure to accommodate the system. The proposed HSR system would bring 10.5 million additional people within one hour of Philadelphia, which will enable Philadelphia businesses to draw from a larger workforce and allow for new levels of collaboration across industries. "China has been aggressively investing in high-speed rail, and operates a total mileage of more than the rest of the world combined. If costs such emissions, pollution and accidents are all taken into account, high-speed railways are far more sustainable than aviation. It is probably the only way to cater cater for super-larger traffic volumes for a market of China's size. In the first 10 days of the Lunar New Year period, high speed railways carried 34 million passengers or 46 per cent of total rail traffic... It is too expensive to build airports to cater to the highest possible congestion"
/ 1 / Philadelphia / NY commute: is it that bad? Depends on how much you make and where you live. My accountant lives in philly and works in nyc. However his firm is 2 block away from penn station and he lives few blocks away from 30th st station. He says it's about 3 hour round trip for him. Also it isn't cheap. Unlimited monthly is about 14-15k a year. * However my accountant saves far more than that by not paying NYC income tax due to how much he makes. Worth to note though he did ***** about fact that before 2005-2006, it was half that and around 600 bucks or less but price started to be jacked up. Hopefully your job pay and difference in taxes make this worthy daily travel for you. Why not look for a job in Philly while you still work at the NYC job? A 2 to 2.5 hr commute will wear you down, bro! (2 hrs via car, 2.5 via train and this is just getting to nyc. do you have to take a train to the nyc job?). If you're single, this will kill your social life. If you start work at 8 or 9, you will have to wake up like at 4-5 am. I had a business associate who was doing the reverse (living in NYC and working in Philadelphia.) After about a year, he couldn't take it anymore and sold his place in the city and moved to the Philly area. We had an employee in our office who moved to Philadelphia and tried to keep his job here. After only a few weeks, he started coming in routinely late and leaving early, calling in a few days a week sick. He was eventually told that he needed to be at work on a regular basis or be fired. It's just not worth it if you have to show up in person at regular hours in NYC. However, if you can work out a deal where you telecommute a few days a week and have flexible hours that would make it better. Taking Amtrak from Penn Station New York to 30th Street Station Philadelphia takes between one hour and eight minutes on the Acela high-speed train, and one hour and 26 minutes on a regular-speed train. One-way tickets start at $43 for a regular regional train and $81 on the Acela. A business-class upgrade costs $22 on the regional train and $61 on the Acela. A monthly pass for commuters costs $1,098, but that allows unlimited travel between the two cities on any train, excluding the Acela. When I did the trip after work one night, I couldn't believe how fast it was. I hardly had time for a nap. my fiancee does this every morning, five days a week, the R7 to Trenton, then NJT to NY Penn station. Takes him two hours. It has been five months so far, and it is really getting to him. He listens to his ipod, and reads books to pass the time. we are trying to move to NJ, to help him with the commute. I say it's doable for a short period of time, with an end in sight. I've done it before (from both sides). It's a terrible commute IMO. My weekdays would often consist of waking up at 5:30 am, getting to work at 8:45, leaving work, getting home around 8:30, eating dinner, going to bed, rinse, repeat. Under normal circumstances it's 2 hours on the bus, or 2.5 hours on the cheaper regional trains (Septa+NJTransit). Amtrak is a nicer option, but it will cost $1400/month and maybe save you 30 minutes, or more for Acela, which will save you 45 minutes) (Unless it's delayed, which happens approx 20% of the time). The bus isn't especially cheap either, comparable to regional trains, but will likely have frequent traffic issues during commuting times. PLUS you have to add to that time on the bus or train however long it takes to get to and from Penn Station(NY) to the office, and to and from your place in Philly to the bus or train station. Not even counting delays in any of the stages, this means it could easily be a 3 hour door to door commute each way. Look at the SEPTA and NJ Transit schedules for the NEC. They both show the connecting trains of the other agency at Trenton. What you would want is to take a SEPTA train to Trenton and then connect to a NJT express train that runs non-stop from Princeton Junction to Newark to make the trip time bearable. A fair number of people do this, although they may commute from a station north of 30th St to Newark and then take PATH to southern Manhattan. There are NYP-PHL daily commuters who take Amtrak, but they are either compensated for it or make enough money to afford it. If you don;t mind buses, Megabus and Bolt Bus run non stop service from Philly to NY. I've taken Megabus many times. Fares start at a dollar and rarely go over $15, unless you book less than a week in advance. They drop off at 28th and 7th and the pick up is at 34th and 11th. Both buses have pick up in Philly about two blocks from 30th St station. You must use Amtrak, the NJT/SEPTA route will drive you INSANE before the 1st week is over....Amtrak is really the only way to do this commute and keep your sanity. - Unless you're going to be commuting 5 days a week for certain, DO NOT get the Monthly Pass, Its a huge waste of $$$ IMO if you commute any less than 20 days a month. - Buy your tickets while the 14-day Advance Ticket pricing window is open (14 days or more in advance). I buy mine for a month 1 to 1 1/2 months ahead of time. My monthly cost comes out to be around 800-850$. The cheapest option for 20 round trips a month is the SEPTA/NJT combo with the change of trains at Trenton. The monthly SEPTA pass is $191. The monthly NJ Transit pass is $440. The total monthly cost is $631 - less than half the cost of Amtrak. One plus is that the monthly SEPTA pass permits use of any SEPTA rail station and also SEPTA bus, trolley and subway lines. The Amtrak pass requires you to get to 30th Street Station, and depending on where you live, that could be an additional cost. The Triangle is one of the largest vacant lots in the city and easily the biggest planning concern in Logan. But it’s not the only one. Last summer, Logan CDC was in the midst of carrying out a neighborhood plan when it ran into financial problems and abruptly shut down. The work, which was funded by Wells Fargo Regional Foundation, has languished since then. But the PRA has now taken it upon itself to see the neighborhood plan to fruition. It has reengaged WRT, the Philadelphia design firm that was working with Logan CDC on the neighborhood planning and resident survey, to finish the job. Abernathy said he’s working to gain the trust of the community, and that he feels confident work at Logan Triangle—which has seen a series of failed proposals over the last three decades—is on track this time. Construction could begin within two years, Abernathy said, though he was careful to point out that Goldenberg himself is less firm on that timeline. Goldenberg’s most visible built legacy in the city are big box stores, the IKEA complex on South Christopher Columbus Boulevard and the Park West Town Center at 52nd and Parkside. The latter was partially subsidized with a tax increment financing package (TIF). His most visible unbuilt legacy is the Disney Hole, the massive surface parking lot at 8th and Market streets. Goldenberg had worked on a proposal to help develop a Disney theme park on the site in the late 1990s and early 2000s, a proposal which later fell through, leaving Philadelphia taxpayers out $10 million. The developer, who was once among former Mayor John Street’s most generous campaign donors, most recently sought to build the Market8 Casino on the same site, but was passed over for a casino license from the state gaming board. Abernathy said on Tuesday night that Goldenberg is the right choice to redevelop Logan Triangle for a number of reasons. For one, he’s the only developer who has shown continuous interest in building something on the site, according to Abernathy. "...the struggle to expand Chinatown. The neighborhood's historic core is quite small"
Philadelphia's Chinatown is a historic oddity. A thriving neighborhood packed with independent restaurants, scrappy markets and hip dining destinations, it is distinct from both its struggling counterparts in the Rust Belt and its upmarket rival in New York City. That is no accident: The community has an activist tradition that stretches from the battle against the Vine Street Expressway to the fight against the Phillies' stadium to more recent anti-casino campaigns. The neighborhood also boasts a set of robust institutions and longstanding Asian landowners, a bulwark against the wasting deaths from suburbanization and gentrification that befell its equivalents in Baltimore, Cleveland, and Washington, D.C.
Today Chinatown continues to face the nebulous forces of downtown reinvestment. Housing prices and land costs are skyrocketing, checking the neighborhood's expansion and making affordable housing difficult to find. Similar circumstances have transformed Washington D.C.'s Chinatown into a Potemkin village, with an iconic welcome gate and Chinese iconography but very few Asians or immigrants of any kind. "There's a legacy of cohesion in Philadelphia's Chinatown, because it fought to protect its territory," says Kathryn E. Wilson, Associate Professor of History at Georgia State University and author of the 2015 book Ethnic Renewal in Philadelphia's Chinatown. "Although the same kinds of pressures were effecting each of those Chinatowns [in New York and Boston], Philadelphia had the greatest sense of stability. What makes gentrification so challenging is it's not something that's easy to mobilize against. It's the private market working the way the private market works." The most obvious manifestation of this trend is in the struggle to expand Chinatown. 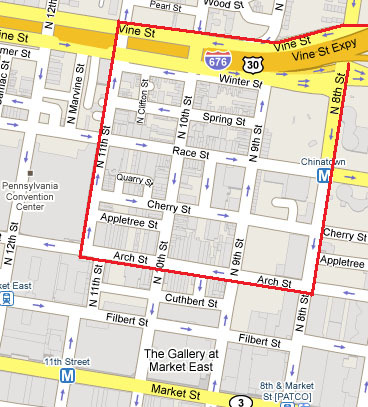 The neighborhood's historic core is quite small, bounded by Filbert Street to the south, 13th Street to the west and 9th Street to the east -- beyond which lie major institutions such as The Gallery underground mall, the Pennsylvania Convention Center and the Independence National Historical Park. To the north is the sunken track of the Vine Street Expressway, beyond which lies an erstwhile industrial neighborhood that traditionally boasted few residents (despite David Lynch’s well-documented time there). In the 1980s it seemed to offer a point of egress for the growing Chinese population. Little of the vibrancy and culinary variety of historic Chinatown has crossed above the expressway. In 2013, an Asian American Legal Defense and Education Fund report found that almost all of Chinatown's Asian restaurants were found in the historic district south of Vine, whereas the area's only remaining manufacturing businesses were based in Chinatown North -- and often served as the backend for the eateries, providing foodstuffs like noodles, fortune cookies and tofu. Most of the neighborhood's population increase is due to a recent influx of high end loft apartments and condominiums. That's been the experience of Joe Chou, a manager at the Happy Sign store on 10th Street. "I'm a Philly guy, it was my destiny," says Chou, who moved here from Taiwan 16 years ago. "It's a historic city and Chinatown is wonderful. I have a job here." But he's never lived in the neighborhood. "The rent is very expensive in Chinatown," explains Chou, who resides in South Philadelphia. "But it would be more convenient for shopping and getting to work." As a result of the neighborhood's rising housing prices, more working-class Chinese immigrants (like Chou) and Chinese Americans have been moving to South Philly and the Northeast over the last couple decades. The city's Chinese population is not large enough to have produced regional satellite Chinatowns, such as Monterey Park near Los Angeles, Sunset Park in Brooklyn or Flushing in Queens, but perhaps that could change if immigration patterns continue. "We are no longer the place where all the Chinese immigrants go through and live," says Sarah Yeung, Capacity and Projects Manager for PCDC. "Much of that is due to where we are and how densely we are built, as well as the increasing rate of immigration." Ken Weinstein, entrepreneur and developer, is well-known for rehabbing properties in Mount Airy. Now, he's turned his sights on Germantown, buying and refurbishing historic or vacant buildings and turning them into modern apartments and stores. "Germantown is still high-risk, low-cost, as far as development goes," Weinstein said in a recent interview. "It's not hot yet, but it's growing. Mount Airy shows what Germantown could be." Across from the Y is Weinstein's newly renovated Cobblestone Flats at 5301 Germantown Ave., 11 apartments and a street-level café opening this year after conversion from a storage facility. Weinstein bought the building in 2011 for $5 million; the café will be run by Marvin Graf, owner of the East Falls Tavern, who plans a brick-oven pizza restaurant. Glad that I can finally post development news about Germantown, a place I think of as the most single most important neighborhood in Philadelphia. This is balancing its extraordinary potential, history, architectural diversity and cache against the vast array of tangible hazards that threaten those characteristics - namely structural decay and crime. I think this project could be a winner. Given the fact that there are already successful lofts near the Somerset station area, I don't think it's that far fetched to imagine artists seeking space in a comparatively well-heeled area of G-town. One block west of the Max Levy building (up on the palisades) is the furthest extent of the gentrification, and it doesn't really pick up along Wayne Avenue or Greene Street until about a mile north of the Max Levy building. That odd missing mile of gentrification is very frustrating, as the Wayne Junction train station is incredibly useful and it would be even more useful if more people actually used it - very many trains don't actually stop at Wayne Junction due to low ridership. Still, today it offers sufficiently frequent service to Center City that I rarely check the schedule when I use WJ, since there's generally a train to CC every few minutes. With the station renovation and the rerouting of the CHE line onto the main platform, the guessing game of which platform to use will go away, which will be a huge improvement. Adding people and activity to Wayne Junction would be a great thing. It has amazing rail and road connections, and it is criminal that it and the area around it are so underutilized. 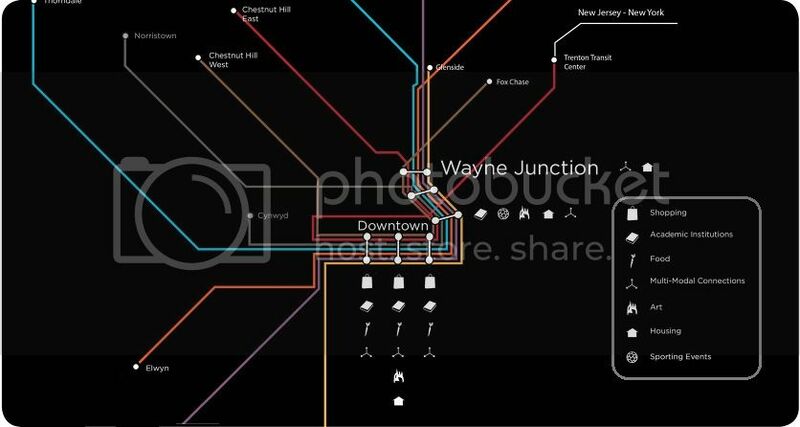 Interesting point - with the exception of Suburban Station, all of the main line train stations are easily accessible to each other - 30th Street, Market East, Temple, and Wayne Junction, but what's the point? It's not like there's much there there at any of the stations; with the exception of Suburban Station, they're mostly just transportation hubs with not much of interest around them. I had thought it was Wayne Junction that was the outlier, but maybe not so much. Still, that's changing, with much change in store and ongoing at just about all of those stations that is livening them up and will continue to do so, even around Suburban Station, too. At the risk of stating the obvious, I think the area around Suburban Station is a good example of the TOD model that all of these stations will gradually move towards, and as Drexel moves towards 30th Street and the hipness of 13th Street takes over Market East and Temple builds up a residential area in the wastelands around the Temple U station then by necessity Wayne Junction's star will rise, just as Fishtown's and Northern Liberties' ascendance is helping the el and nearby stops on the el. Six minutes from Wayne Junction to Temple. Four more to Market East. Five more to Suburban. Five more to 30th Street. Not too shabby, once there's more reason to go to those stations. Another major barrier to making this a better place to invest is the intense blight going north on Wayne Avenue. it's the corridor itself that is severely blighted, not nearly so bad east or west. It's technically mixed use, but obviously failing today. Aug 3, 2009 - To do that, the city would focus the grant funds on transit-oriented development. The area of the Wayne Junction train station, Mantua and Point ..
With its emphasis on civil rights, public safety and livability, the plan makes it clear that Chicago Chinatown wants to be a place that people call home — not just a tourist attraction, or a historic curiosity. But there is a fundamental tension in envisioning the polyglot Chinatown of the 21st century. In Chicago, New York City, San Francisco and other cities, Chinatowns are the direct result of racism. Segregationist housing practices pushed Chinese immigrants into isolated enclaves where they banded together in a society that enshrined its distaste for the Chinese in law. Whether it was in places of worship offering services in Mandarin and Cantonese, or community banks catering to immigrants, Chinatown was a place where day-to-day life wasn’t stunted by exclusion. While their appeal as a weekend destination was growing, Chinatowns were seeing the start of a residential exodus. Prompted by urban unrest in the 1960s and ’70s and corresponding white flight, many Chinese people chose to move to the suburbs — or to the “ethnoburbs,” as some have dubbed them. D.C. residents moved into Maryland and Virginia. In New York, Chinese families shifted to the outer boroughs, especially Flushing, Queens, and Sunset Park, Brooklyn. Los Angeles residents headed to the San Gabriel Valley, which today is home to eight of the 10 cities with the highest proportion of Chinese-Americans. Monterey Park is believed to be the first suburban Chinatown. More than 30,000 attendees crowded Chicago’s Chinatown for the Lunar New Year Parade on February 14. The Chinese are the fastest-growing immigrant group in Chicago, and the city’s third largest overall. The Chinatown on the South Side is its second location, established after the first Chinatown in The Loop — founded by Chinese people fleeing racism on the West Coast — was pushed out by mounting discrimination, overcrowding and economic pressure. But in its present location, Chinatown is a bustling center of services and commerce. It’s also home to 8,000 residents, a number that has risen even as the overall population of Chicago has fallen. Residents are also increasingly arriving from different regions of China, bringing with them new-to-Chicago traditions and foods. Most modern Chinatowns are serving less as a singular manifestation of Chinese-American life than as a central gathering place for people to experience Chinese culture — whether or not they have a Chinese heritage. And indeed, Chinatowns themselves were often built on the ground of former ethnic enclaves that had organically dissolved; the one in Manhattan has previous incarnations as the Irish Five Points and Little Italy. But as Chicago’s Chinatown demonstrates, this is not a predictable story. More than a hundred years after its founding, the neighborhood has a dynamism that can’t be neatly scripted. “Chicago Chinatown is the only one in the country that has not been gentrified and also has been expanding,” says Wong, of the Chinese American Service League. "Other issues: expanding and enhancing open space near Tacony Creek, reuse of abandoned railways, and maintenance of traditional neighborhood commercial corridors at 22nd & Lehigh, Broad & Erie, and 5th & Lehigh. Rail stations at Broad & Glenwood and 22nd & Allegheny create opportunities for higher density, mixed-use development..."
"Our 22nd Street Transit-Oriented Development Plan is designed to develop for-sale and rental housing units and renovate vacant industrial space within close proximity to the Allegheny Avenue regional rail station. The development of newly renovated housing units and retail space within walking distance of the train stop presents an opportunity for residents and small businesses to connect more easily to the surrounding region. Residents working outside the city will find their new homes’ proximity to the R6 Norristown line a pleasant convenience, and the short distance between the proposed new retail units and public transit provides potential consumers with easy access to goods and services. In total, this project calls for the development of 70 units of for-sale housing, 100 units of rental housing, approximately 40,000-square-feet of retail space and the redevelopment of approximately 50 acres of light industrial space." Time for Millennials to Buy? What Neighborhoods? ... Quattrone said the big thing homebuyers should take advantage of now is low interest rates — across the country, the Fed says interest rates will increase by October. While it’s not expected to be dramatic, Quattrone said the buying power one could have now is greater than it will be by late fall of this year. The key is to buy in a neighborhood where the buying power will be maximized. 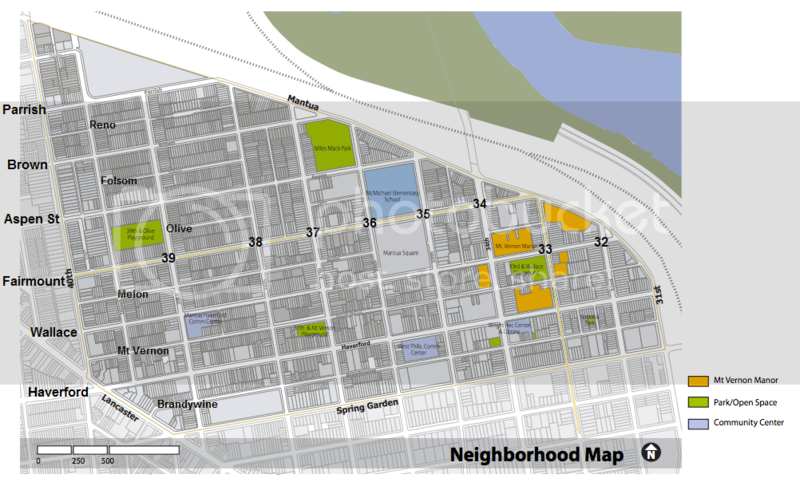 And from where Quattrone is sitting, three neighborhoods in Philadelphia stand out. And while they are considered “developing,” it’s worth noting that some see that as a nicer word for “gentrifying.” As young professionals and families push outside the limits of Center City, tax rates and rent prices are going up in neighborhoods that were once on the outskirts. FISHTOWN (pop. 12,505; median price: $260k) E. of MFL: Girard, N. > Berks sta. This is probably a no-brainer. Over the last five to 10 years, Fishtown has exploded with bars, restaurants, amenities and new construction to accommodate and increasingly younger, artistic base of residents pushing out of Northern Liberties and other neighborhoods in the area. Quattrone said Fishtown still has room to grow — a lot of the construction is either rehabbing single-family homes and condos, or ripping down old warehouses that aren’t in use and building apartments on top. She said what sets Fishtown apart is that it’s been an occupied neighborhood (read: fewer vacancies) “for forever,” so infrastructure is already in place for amenities drawing in new residents. FRANCISVILLE (pop. 9,613; median price: $309k, $225 psf) W. of BSL: Fairmount, N. > Girard sta. This area that was once seen as just the northern part of Fairmount has broken off and solidified itself as one of the hottest neighborhoods right now for real estate, but it’s different from Fishtown — Quattrone says it’s been gentrifying over the last four years, mainly because of new construction that’s for sale or rent. It has less amenities than Fishtown, but that’s quickly changing as a 24-hour gym, a brewery and a slew of brand-new apartments are being put in this year. 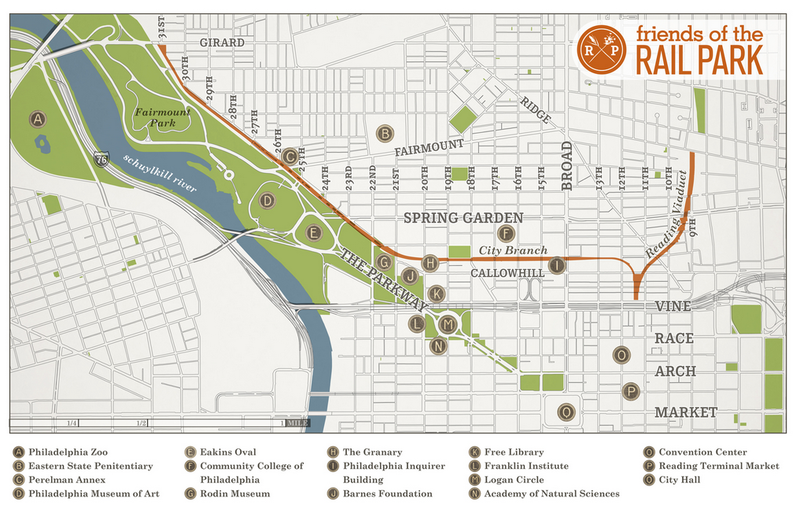 But what’s really attractive about Francisville is its proximity to Center City and its accessibility via the Broad Street Line. Quattrone says this still-developing neighborhood will be valued for how close it is, and could easily become “the next Graduate Hospital” — a southwest Center City neighborhood that’s become a huge haven for ambitious developers and young professionals moving in. Its growth rate for young people is one of the highest in the city. POINT BREEZE (pop. 16,391; median price: $165k) W. of Broad St: Washington. 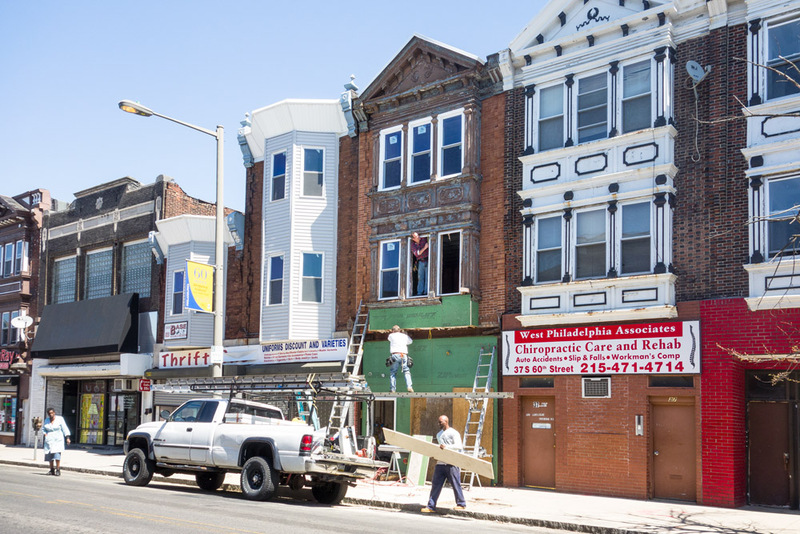 S. > Mifflin St.
You’ve heard this one before: Point Breeze is changing. Extremely quickly. Neighbors have battled gentrification for years in this neighborhood, but young professionals who at one time would have liked to live in Graduate Hospital are now pushing south into Point Breeze. To accommodate that, the neighborhood is seeing a great deal of new homes, construction and rehab — making it one of the hottest ‘hoods for real estate in the city. WHO, & WHAT IS DRIVING the Growth from the Center City? Who’s Moving to Center City Philadelphia? The short version: Most of the people who will occupy these new homes and apartments will fall into two growing Philadelphia demographics. They’re the young and employed, and those nearing or over retirement age. Normally, he says, people move into more expensive housing as their income improves, freeing up better housing to the next income level until structures in the worst condition get demolished, and he didn’t see that happening in Philadelphia, for years. “What’s going on in Center City is causing it to expand outward,” says Victor Pinckney, vice president of the Homeowners Association of Philadelphia. He’s focused on rehabbing homes in Philadelphia neighborhoods north and northwest of Center City. City officials say it's that displacement from neighborhoods that are skyrocketing in price that propels new development in fringe neighborhoods. "Most of it is developers responding to what they perceive to be market demand, which comes from a burgeoning population, particularly of younger people who want to be here, are getting jobs here and can't afford to be buying $600,000, $700,000 properties at this point in the neighborhoods that fringe Center City," said Alan Greenberger, deputy mayor for economic development. "Let alone in Center City, which is even more expensive." 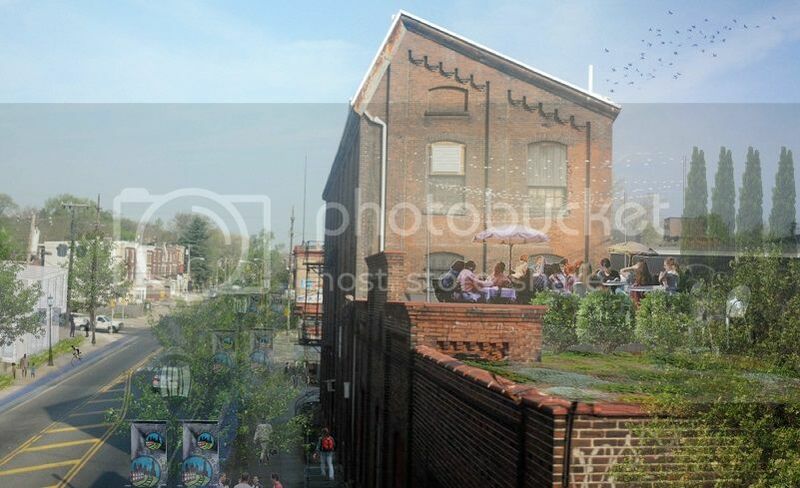 Greenberger pointed to pricier neighborhoods just outside Center City - like Queen Village, Southwest Center City, Fairmount and Northern Liberties - as examples of how development has tended to push outward from the core. He said that he couldn't speculate on exactly where the next big boom might bring new young residents and development, but that some areas are under pressure because they're still affordable and are not far from the hubs where people work. "There's certainly development pressure on both the east and west sides of South Philadelphia, and there's development pressure in Fishtown/Kensington," Greenberger said. "It's a constant sort of stream of transitions, and [in] those areas, [they] are happening faster." Still, those venturing into largely uncharted territory say being among the first is risky. "What we do, there are no [comparable projects] for," Longacre said. "So, I've got to go to the bank and say, 'Oh, yeah, by the way, I've got to borrow this money, and I understand there are no comps around that will substantiate our crazy idea, but here's why it'll work.' "
NEXT HOT SPOTS? : (Lower) North Philly? Point Breeze? welcome to the epicenter of the city's next big housing boom: North Philly. "I really see big things coming to this neighborhood. I've been a big fan of it," said Patton, 38, who grew up in Delaware County and once worked in computer science. "One thing it could definitely use is more amenities - and we're hoping to be one of them." Patton's wager is a risk that more and more developers, entrepreneurs and homebuyers are taking in neighborhoods like lower North Philly, Kensington and western Point Breeze. In those less-developed sections - many plagued by crime, blight and poverty - land and housing costs have remained relatively low, creating opportunities that are increasingly scarce in booming areas like Northern Liberties and the eastern portion of Point Breeze, where real-estate prices have skyrocketed. Developers, experts and residents note a handful of characteristics that make those neighborhoods stand out as likely places for the next big booms: easy access to public transit, proximity to Center City, hip amenities and real estate that's still affordable for young adults. Patton isn't the only one putting his chips on North Philly. Since 2009, developer Chad Ludeman, of Postgreen Homes, has been buying up land and building trendy, environmentally conscious housing in the neighborhood and along the outer fringes of Kensington and Fishtown, where empty lots once dotted many blocks like missing teeth. Ludeman's vision, he said, is to keep buying and building in areas within short walking distance of the Market-Frankford Line. "Proximity to the El is huge for us. That makes us comfortable going into an area that's still on the upswing," Ludeman, 36, said recently as he sipped coffee at La Colombe's new Fishtown outpost on Frankford Avenue. He said Postgreen plans to continue to press north along the train line, building smart, residential housing that sticks "as much as possible" to city zoning code, so as not to crowd neighborhoods and impede on residents who've been there longer. Longacre said he's taking a gamble on the far edge of Point Breeze because it needs just a few more amenities to take off. "If you can find a neighborhood that maintains a decent amount of physical assets but is suffering from disinvestment, there's probably a pretty good likelihood that you can fix it by virtue of changing maybe just the thought process, the identity, putting in a couple new businesses, doing some residential infill," he said. "And then it'll happen." If U.S. Census data for the areas on which Longacre, Patton and Ludeman have set their sights are any indication, their bets are good ones: The numbers show promising trends with increases in median income and residents with bachelor's degrees evident in three ZIP codes that cover the neighborhoods - 19145 in Point Breeze, 19122 in North Philadelphia and 19125 in Kensington. In Point Breeze's ZIP code, according to census data and American Community Survey's 2009-13 five-year estimates, the number of residents older than 25 with bachelor's degrees or higher increased from 10 percent in 2000 to 18 percent in 2013. In North Philadelphia, the number of residents with at least bachelor's degrees increased from 9 percent to 14 percent. In Kensington, an even more impressive jump: Compared with 8 percent of residents 25 and older holding bachelor's degrees or higher in 2000, an estimated 31 percent had that level of education in 2013. Median income and declining poverty levels paint a similar picture: From 2000 to 2013, the median income increased 44 percent in Kensington's ZIP code, 34 percent in Point Breeze's area and 28 percent in North Philadelphia. Percentages of residents living below the poverty line in the areas - all of which had more than a quarter of their populations below poverty in 2000 - decreased, but with less drastic changes than the increases shown. For far too long, Philadelphia was a punchline, never getting the respect it deserved, even from city residents. Not anymore. Philadelphia today is synonymous with urban comeback and growth. Over the past 25 years we've gone from being a symbol of urban distress to being a leader of America's urban renaissance. The big question for the future would seem to be: Can creative commercial development be a catalyst for sustainable social progress? We'd like to answer that question with an emphatic "yes." Ambitious commercial development directly tied to a specific community agenda represents the best hope for an inclusive future for Philadelphia. Drexel University and Brandywine Realty Trust share that belief, and we are backing our conviction with a $3.5 billion investment in a project called Schuylkill Yards, on the west bank of the Schuylkill adjacent to Amtrak's 30th Street Station and Brandywine's Cira Center office towers, and at the gateway to Drexel's main campus. 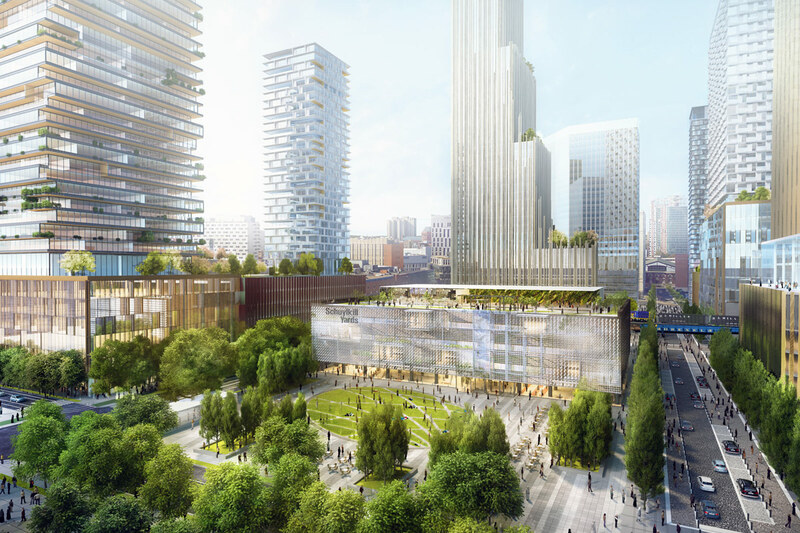 The master plan for Schuylkill Yards made public Wednesday reveals some game-changing influences for Philadelphia's growth. This 14-acre development will be the largest in the city's history. It will include spaces designed for innovative start-up companies, research laboratories, and corporate offices, along with residential building, retail, and hotel space, and ample open green horizons. At the end of the 15- to 20-year construction phase, this will be an appealing neighborhood that combines commercial buildings with some of the most welcoming public spaces in urban America, a civic commons unlike any other. Long-term plans also call for Drexel to explore new avenues for its long-standing partnership with the Philadelphia School District. This means deepening our investment to help ensure that young people in West Philadelphia get the education they need to enroll in schools like Drexel or the University of Pennsylvania and someday work in one of the knowledge-based firms that take root in Schuylkill Yards. Its strategic location encourages easy collaborations with University City's rich mix of higher education, medical, and scientific institutions. This level of collaboration is in keeping with the concept of urban innovation districts, and Schuylkill Yards has been inspired in part by the work of Bruce Katz of the Brookings Institution, a prominent authority on innovation districts. In terms of the city's long-term development, this is a giant step ahead in Philadelphia's growth westward, as Center City and University City come together as the heart of one vibrant district, tied together by the ribbon of the Schuylkill River. This is a future the whole city can take pride in, and one that should offer opportunity to all Philadelphians. Drexel’s massive development project calls for national and international corporate partners seeking to attract the pool of academic and professional talent from Drexel. Furthermore, the Innovation Neighborhood will serve as a hub for start-ups by creating educational, employment and other opportunities for Philadelphia residents. The proposed neighborhood will include market-rate and student housing options in response to the needs of the surrounding neighborhoods, as well as street-level retail spaces that are expected to enliven the project’s major buildings and create pedestrian corridors along JFK Boulevard and Market Street. Additionally, green spaces and streetscapes will interconnect the project’s buildings creating a unique sense of mobility, while parking will be integrated in the overall plan in strategically located structures. A large swath of land comprised of mostly junk yards is poised to become a large mixed-use, retail shopping center in the Fairhill neighborhood of North Philly. Dubbed Plaza Allegheny, construction on the nine-acre site at 400 West Allegheny Avenue will begin at tomorrow's groundbreaking ceremony, the Mayor Jim Kenney's office announced today in a press release. The $16 million Plaza Allegheny will be a 85,000-square-foot retail shopping center and bring 140 jobs to the neighborhood, which at one point was a bustling manufacturing area and home to a predominantly Latino community. As factories began to shut down, the Fairhill turned into a string of vacant lots and junk yards. According to a retail brochure for Plaza Allegheny, the center is expected to deliver in April 2016. The following retailers are currently on board: Save a Lot, Advance Auto Parts, Little Caeser's, Dunkin Donuts, and Subway.